乳腺皮肤有明显充满乳腺癌转移细胞的淋巴管腔。癌经常转移至淋巴管。乳腺癌最常转移至腋淋巴结，而且这些淋巴结通常在乳腺癌外科手术时被除去。 The skin overlying the breast has prominent lymphatic spaces filled with small metastases from breast carcinoma. 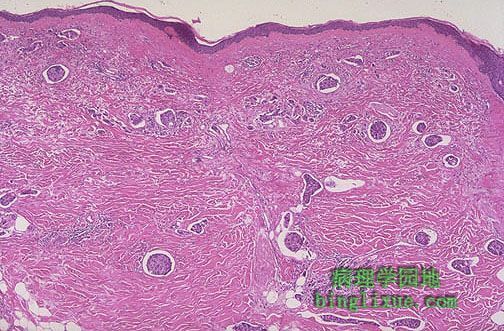 Carcinomas often metastasize to lymphatics. Breast cancers most often metastasize to the axillary lymph nodes, and these nodes are often removed at the time of surgery for breast cancer.